Whole quartered heads of Napa cabbage (pogi) take longer to ferment but yield kimchee with more character and flavor. Mak kimchee is for casual dining. Over the course of this eCookbook project I’ve made many varieties and more kimchee than a Korean grandmother at a family reunion: whole-head (pogi baechu), mixed salad (mak baechu), non-spicy (baek baechu), fermented radish (kkakdugi), stuffed cucumber (oi sobagi), radish (bunhong mu) .... green papaya, watermelon rind.... etc. Kimchee is a semi-raw fermented food that’s rich in vitamins and beneficial microbes (probiotics... there I said it). FYI, traditional kimchee is not vegetarian since most varieties employ fermented fish sauce and in some cases beef marrow. Chitin and amino acids are essential to achieving a deep umami flavor. Although I’m not a vegan the version of kimchee that I make actually is. I get a skin reaction from shellfish. The source of chitin in my kimchee comes from shiitake mushrooms, miso and dried seaweed. But what does one do after fermenting that much kimchee? Weaponize it? Cook with it? Heating above body temperature or freezing will most certainly kill lactic acid bacteria (LAB). But according to Austin-based nutritionist, Holly L’Italien (Merrit Wellness Center) most of vitamins A and C in kimchee are still viable along with trace minerals such as zinc, magnesium and potassium. Vitamin B completely disappears. Kimchee has a bold, piquant flavor that complements most savory meals. Oddly enough its notorious pungent aroma mellows after long and slow cooking, but sometimes the spice tends to build and sneak up on you. For optimal nutrition, she recommends adding fresh kimchee towards the end of your cooking time (in soups and stews), making it into a sweet relish, or eating it as a freshly fermented condiment along side with your regular meals. Sugar as a polymer actually coats and protects LAB and its spores and prevents them from dessication. For a healthy treat Holly recommended a kimchee cheddar cheese ball with walnuts. It’s debatable if flash frying destroys all nutrients in kimchee (frying temp 375°F). But who doesn’t like Korean fried chicken marinated in fermented chili paste or fried wontons? In theory a dipping sauce made with kimchee juice would remedy that. The juice formed in fermentation is rich in nutrients. Although lately it’s sold a health tonic, I refine and use it as a marinade, cooking liquid or as a fermentation starter. I like using minced kimchee as an ingredient in meatloaf or in my favorite go-to meal, Korean fried rice topped with a fried egg. K.I.K.O., Kimchee In Kimchee Out—these jars of Napa cabbage kimchee are near the end of their rotation of four weeks. After many long discussions and test batches, Ms. L’Italien helped me develop a powdered kimchee seasoning that I call Hanguk Saffron. After dehydrating kimchee at a low temperature I mill it into a powder and adjust the flavor before storing in air tight foil packets. It retains most of the vitamins and minerals at this low drying temperature. I have to admit that powdered kimchee is not a new idea. But the commercial grade of this powder is rather course and always slightly bitter. It’s made from the dried scrapings of the fermenting jar (ongi). Mainly used as a flavor additive for instant soups, it has enough MSG to choke a horse. I wanted to create something more refined that I could use as an ingredient in baked goods, fresh pasta or as a seasoning for meat and vegetables. My Hanguk Saffron has a deep savory flavor that’s tangy with a mild heat. 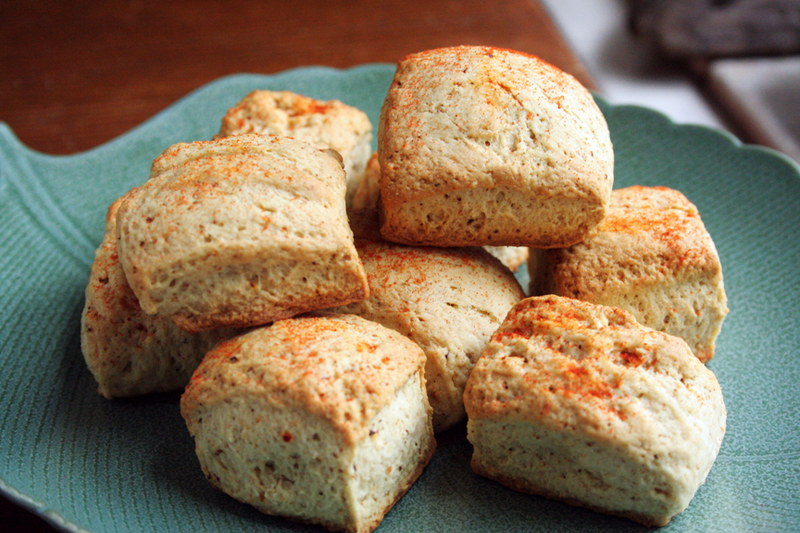 I it use to make kimchee butter for my buttermilk biscuits and I also as a dry rub for my smothered kimchee pork chops. It blends well in soups and stews and imparts a lovely peach color. Can one ever have enough kimchee? Probably not, which is why you should make it yourself or move in with a Korean family. Smothered kimchee pork chops with maple kimchee relish—America’s Southern cuisine meets South Korea on this plate. i had the chance to go to Korea and i have to say kimchi is one great and delicious food! My brother had the chance to go to Korea and he bring it for my, it delicious and i have to say kimchi is one great and delicious food!